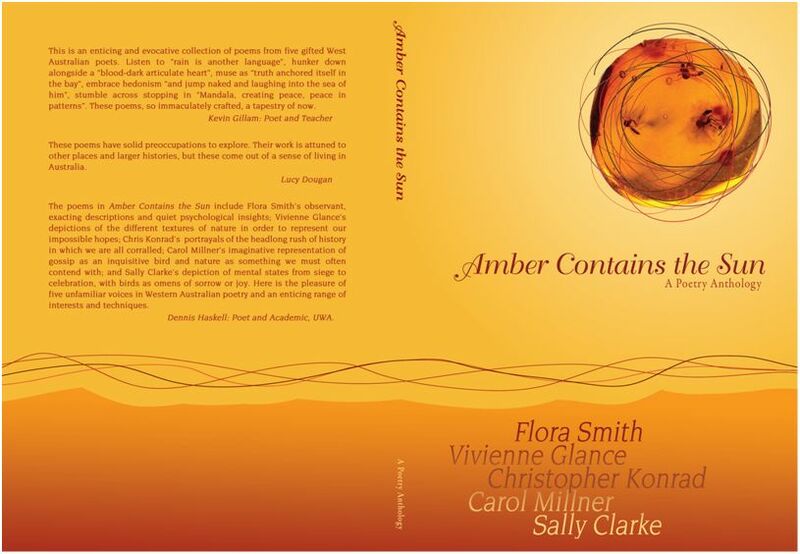 2008 – Amber Contains the Sun, co-authored with Sally Clarke, Vivienne Glance, Carol Millner, Flora Smith, funded by the Department of Culture and the Arts WA and launched at the Perth Writers’ Festival in 2009 . 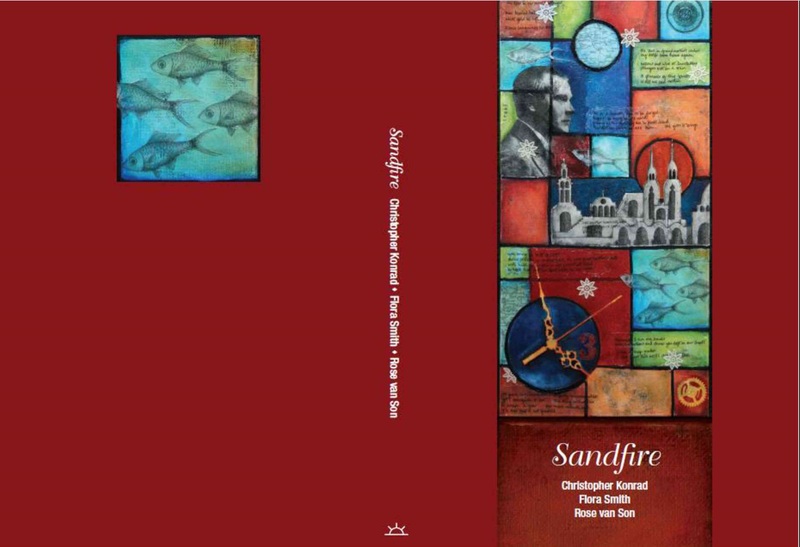 2012 – Sandfire, co-authored with Flora Smith and Rose Van Son, published by Sunline Press. 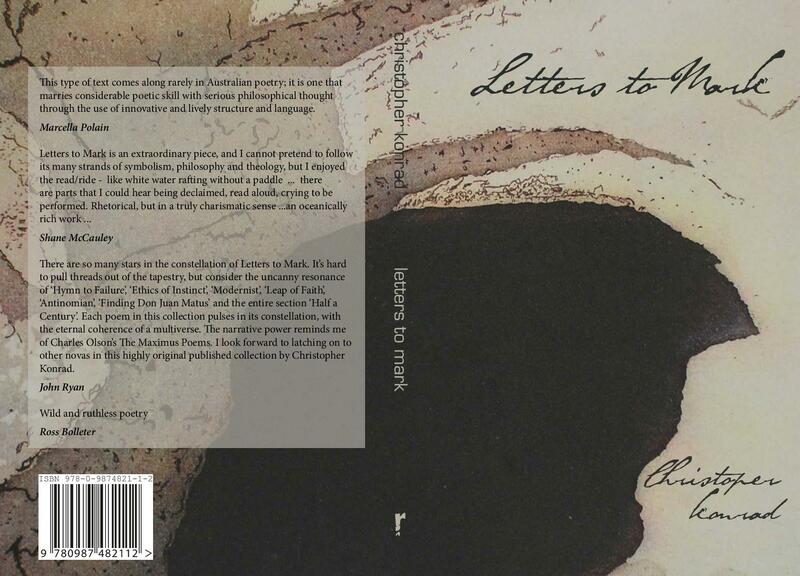 2014 Letters to Mark published by Regime Books. This type of text comes along rarely in Australian poetry; it is one that marries considerable poetic skill with serious philosophical thought through the use of innovative and lively structure and language. There are so many stars in the constellation of Letters to Mark. It’s hard to pull threads out of the tapestry, but consider the uncanny resonance of ‘Hymn to Failure’, ‘Ethics of Instinct’, ‘Modernist’, ‘Leap of Faith’, ‘Antinomian’, ‘Finding Don Juan Matus’ and the entire section ‘Half a Century’. Each poem in this collection pulses in its constellation, with the eternal coherence of a multiverse. The narrative power reminds me of Charles Olson’s The Maximus Poems. I look forward to latching on to other novas in this highly original published collection by Christopher Konrad. 2016 Argot published by Pomonal Publishing. In this collection of poems, Christopher Konrad explores the domain of the personal, perhaps even secret speech; the half hidden languages derived from culture, family, and desire. Employing that slippage of language which only poetry can properly convey – the liminal, free-floating structure of the written or spoken word – enabling it to be just what we make of it, moment by moment, in a changing emotional, cultural, linguistic and historical context. First prize in the Creatrix Poetry Prize 2009 (WA) for the poem ‘Trakl’; First Prize in the Tom Collins Poetry Prize 2009 (WA) for ‘Thaumaturge’; First Prize and Third Prize in Spilt Ink Poetry Prize 2012; First Prize Glen Philips Poetry Prize 2015. 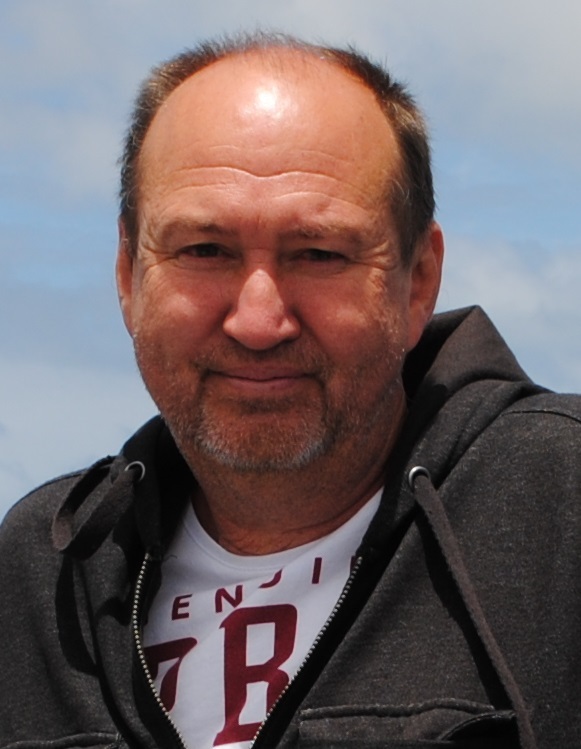 Chris also won First Prize in the Todhunter Literary Award 2012 (WA) for his short story The soldier’s wife also published in the Westerly 58, (1) 2013. He has received many other awards including having his poem ‘Window onto the Bay’ published in The Best Australian Poems 2013. Judge of Edith Cowan University Talus Poetry Competition 2010 and on the panel judging the Creatrix Prize 2013. Co-editor and co-author of Breath of the Sea, an anthology of Western Australian poetry, put together under the auspice of the Peter Cowan Writer’s Centre. Hi Chris, Michelle Mars here. Finally got my website up and running.